He was the drug lord whose murderous campaign of narcoterrorism helped transform his native Colombia into the murder capital of the world. I knew that the violence he was generating would always turn against us. Thousands lost their lives during Pablo Escobar’s reign at the top of the infamous Medellín cartel – a powerful drug trafficking ring which, during the height of its operations, brought in more than $60 million per day and supplied an estimated 80 percent of all cocaine smuggled into the US. Beginning his criminal career stealing cars and selling contraband cigarettes and fake lottery tickets, Escobar rose quickly through the ranks of the Colombian criminal underworld, often kidnapping and killing anyone who stood between him and his business interests. By the early 90s, the so-called ‘King of Cocaine’ was the wealthiest criminal in history, turning over $21.9 billion a year in personal income, putting him among the richest men in the world. Following his death during a shootout with police in 1993, his family fled Colombia for Mozambique, eventually settling in Buenos Aires Argentina where Escobar’s son, Juan Pablo, chose the name Sebastián Marroquín and sought to distance himself from his father’s and the Medellin Cartel’s nefarious activities. After decades of remaining tight-lipped about his father, in the last few years he has written two books and featured in a documentary on the subject. Euronews met with Marroquín to ask why, after so many years of silence, he has decided to reveal all about his relationship with his murderous father. “The worst violence imaginable,” he responds when asked about what it was that made him turn away from the path his father carved for himself. After decades of silence, Marroquín says he feels he has a duty to tell the truth about Escobar. He tells Euronews that “glorification” is the “best ingredient” to make money from his father’s story, and that TV series and movies don’t even scratch the surface of his cruelty. 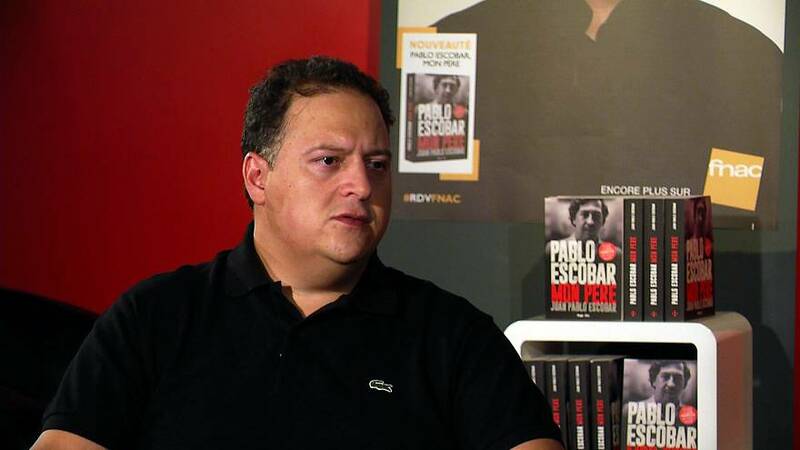 “It seems to me that the image of Pablo Escobar has been used to tell stories about him that are not true,” he says. Pablo Escobar – dubbed El Padrino by those who adored him – spent vast sums of money trying to ingratiate himself with the Colombian community. With the billions of dollars he made trafficking tons of cocaine out of the country, he built homes, hospitals, schools and sports centers and, according to Marroquín, these acts of generosity brought him “sympathy from the social classes who felt most abandoned [by the government]”. Before long, the press began to call him ‘Robin Hood’, and Marroquín says that the image he cultivated “guaranteed impunity and protection for many years”. But there were also contradictions to his father’s kindness, Marroquín says; a certain irony in his quest to do good. In spite all that his father had done, Marroquín’s first book was dedicated to El Padrino for showing him the path not to take in life. “As a son,” he says, “I have the best memories of him as a father and the worst of his violence. Escobar’s illicit activities were no secret. Everyone, including his family, knew of the thousands of murders Escobar ordered, the kidnapping and torture, and, of course, the drugs. As a young teenager, Marroquín did not keep his opinions from his father. “I had him face to face and I told him a thousand times that I didn’t like the bombs he planted, I didn’t like that he kidnapped people, that he murdered people,” he says. And this, according to Marroquín, is what sets his books apart from the works of others on the subject of his father. “The imbalance between the truth behind this story and the fiction people want to sell about my father’s life is evident,” he says. However, he says he can’t stop people telling stories about Escobar, because he does the same thing. But he feels the thing makes his stories different to the others is his refusal to glorify his father. “I think the difference is summarized in a letter I received recently when I was presenting my second book in Argentina,” he says. “A 13-year-old boy gave me a closed envelope and told me that he had known who my father was since the age of eight. After fleeing Colombia following the death of his father, adjusting to normal life was difficult for Marroquín. Escobar had gone down in a hail of gunfire when he was discovered hiding in a neighbourhood of Medellín following his escape from prison. With authorities closing in, a firefight ensued and despite trying to make good his escape by fleeing across the rooftops, Escobar was felled by a fatal shot to the head. However, in spite of all he had done, he was given a hero’s farewell, with 25,000 people lining the streets of Medellín on the day of his funeral. His wife, son and young daughter fled the country, looking for asylum before settling, eventually, in Buenos Aires, where Marroquín still lives today. He now has a son of his own, which raises the difficult question of what to tell him about his infamous grandfather. “Obviously, I’m not going to start telling him what prohibition or the drug trade is,” says Marroquín. But as for keeping Escobar’s transgressions from him, Marroquín refuses to do so. What would he say to those who would idolize his father? According to Marroquín, the money and the luxury that came with his father’s profession were only a tiny fraction of a much larger picture. In his words, he would not recommend that anyone gets caught up in his father’s world.